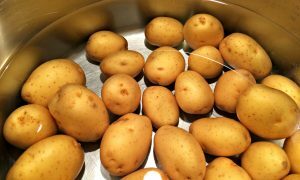 Uist Crofters begin chlorinating Tatties for Brexit. Smiling crofters have been dunking tatties in concentrated chlorine across the islands in preparation for a “huge” new trade deal with the USA. “This is great news for the islands, we have a lot of chlorine left over from when we tried to clean Barra and it’s great to finally be using it up” said Iain Chaimbeul – a crofter and chlorine hobbyist from Bornish. “They filled Lionaclait swimming pool with tatties, I think my sister is in there but there is no way of knowing”. – Anna MacKenzie. “ I am in serious need of medical attention” – Dòmhnall Iain Bàn. “This is the worst thing to happen in the Uists since Angus Munro spiralized a turnip”. – Angus Munro’s father.